What you already know, which is how to configure the servers and the overall application in your local datacenter. What you might not already know, which is how to adapt and design the application for the networking, storage, and compute elements of Azure infrastructure services. 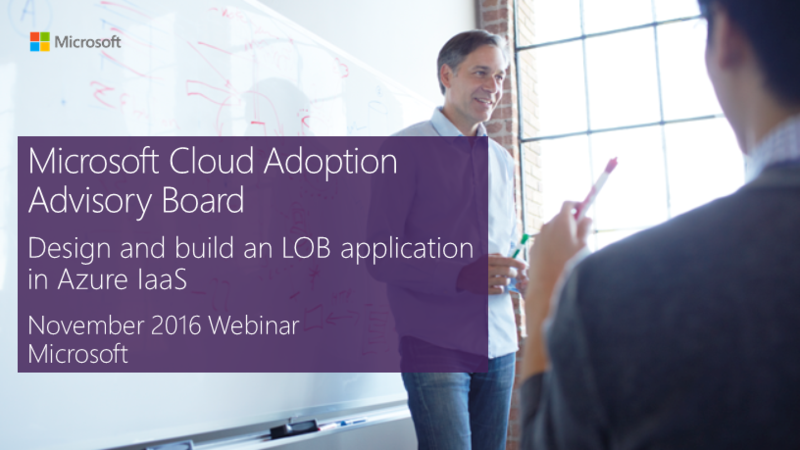 To understand this design methodology and use it for your own LOB application, see the Design and Build an LOB application in Azure IaaS video and slide deck of the November 2016 webinar for the Cloud Adoption Advisory Board (CAAB). PowerShell command blocks Each slide is a fill-in-the-blanks set of Azure PowerShell commands to build an element of Azure infrastructure services. Design your naming conventions Tips for determining how to name your Azure infrastructure elements. Use this design methodology for accelerated and successful deployments of LOB applications hosted in Azure infrastructure services.